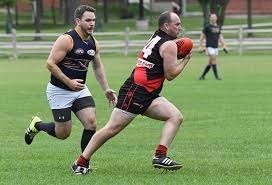 The Toronto Dingos and the Toronto Eagles faced off at Humber College South in round 11 AFL Ontario action. Both teams remain well in the hunt for finals contention with the Eagles in 2nd going into this one and fighting for the top spot, and the Dingos still holding on in 5th with some tough matches to play not the least of which would be this clash. As is often the case come August in Canada both teams were nursing some absences due to a combination of factors but still managed to field solid rosters on the day. Out of the gate the Eagles were the showed why they are one of the form teams in the competition, quickly kicking away to a 3.4-22 to 0.1-1 lead in the first quarter. The second quarter saw more of the same with the Eagles striking out to a 6.11-47 to 0.1-1 lead by half time, which couldn’t come fast enough for the Dingos. It was in the third quarter that the hard work of Michael Ladd and Michael Beda in the middle and Justin Powick kicking forward out of the half back line finally paid off. With some more possession and some uncharacteristically ill-disciplined play from the Eagles to boot the Dingos were finally able to add two majors and some pressure to the game. Michael Ladd picked up both goals. At the end of the third the Eagles still led comfortably though, 8.16-64 to 2.3-15. The Dingos have blooded many new Canadians this year, excellent news for the future, but are still struggling to work as a team to consistently convert individual possessions into applied offensive pressure and ultimately scoring opportunities. In the final term the Eagles again lifted the bar and ran away with the game 11.23-89 to 2.5-17. Ben Moller was best on ground for the Dingos, having stepped up his efforts in defense without usual partner in crime Tim Indian. The Eagles’ behind tally attesting to just how busy he was all day and how much more damage could have been accrued. The Dingos will have little time to reflect on this one, as they face another tough opponent in the Toronto Rebels and will surely need at least one more win in the remaining matches to secure a finals berth.